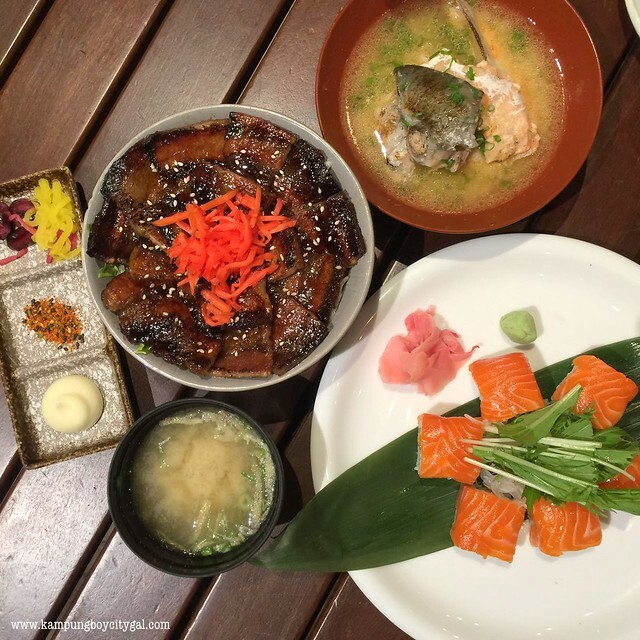 Best Casual Japanese Restaurants in KL. In Japan, an izakaya is a popular spot for friends or coworkers to meet up for a drinking party or to wind down after work. 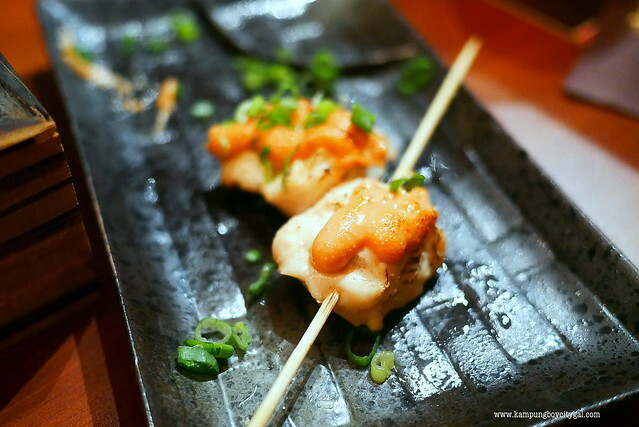 There are just too many izakayas in Japan that serve delicious food and drinks at very affordable prices. We always make it a point to visit 1 or 2 izakayas for drinks and snacks whenever we are in Japan. 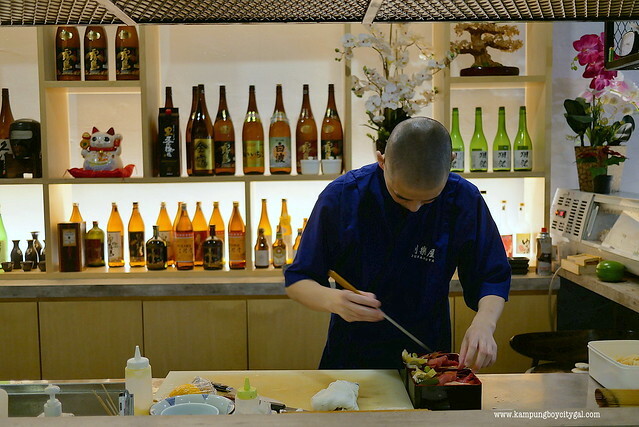 The izakaya wave has hit KL and this new breed of Japanese “restaurant” is fast gaining a following. 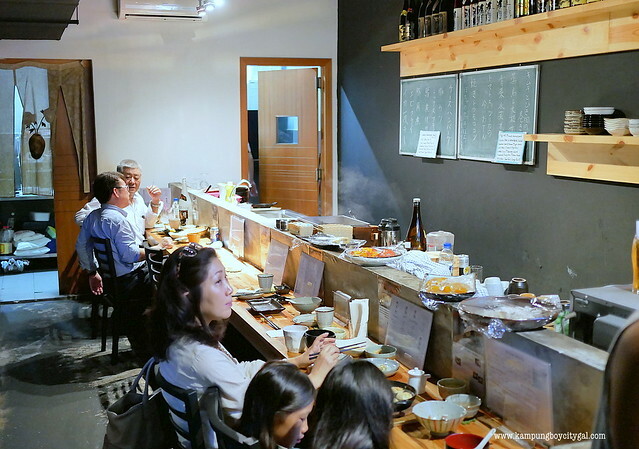 Serving up everything from yakitori, fried squid, chicken karaage to nabemono (hotpot) and ramen; izakayas in Malaysia has also come to mean Japanese casual dining. 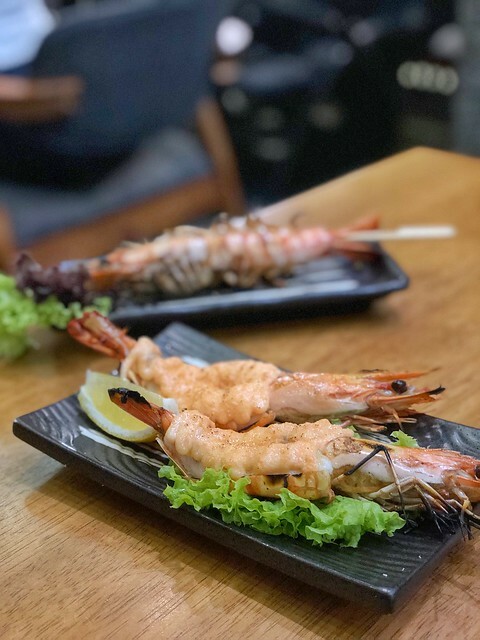 Whenever we feel like having a satisfying Japanese meal that won’t burn a hole in our pockets, izakaya is the place to go to. 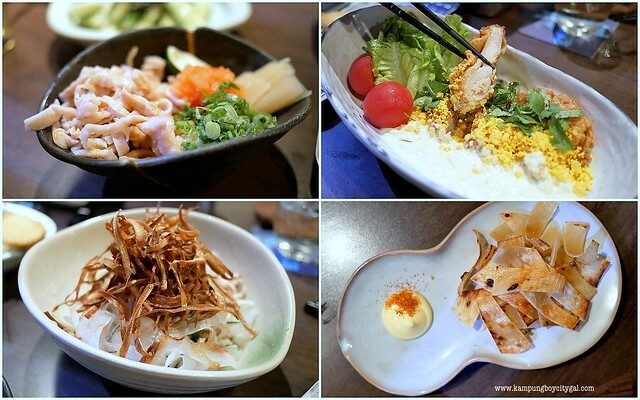 Here’s our pick for the 5 Best izakayas/Casual Japanese Restaurants in KL. Instead of an izakaya, mum’s kitchen describes Saisai better. And in this case it really is like mum’s cooking, since its owner Mika-san & chef Moritsuna Sakuma offer the best of their home cooking here. 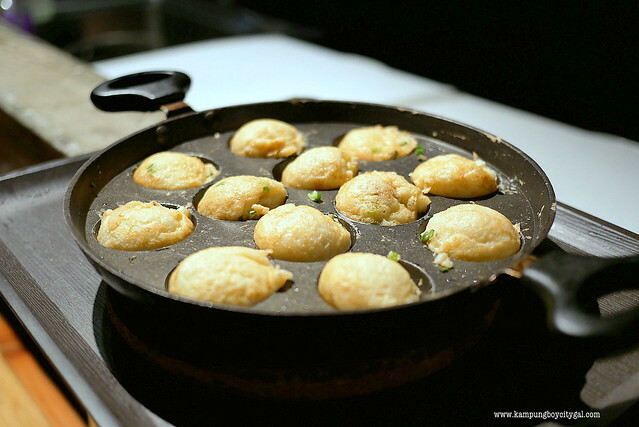 Saisai impresses with its no-frills simplicity and charm across both food and decor. The small space has a home like atmosphere. Everyday, Mika-san will feature some small dishes on the little black board where patrons can have sampling portion for less than RM 10. 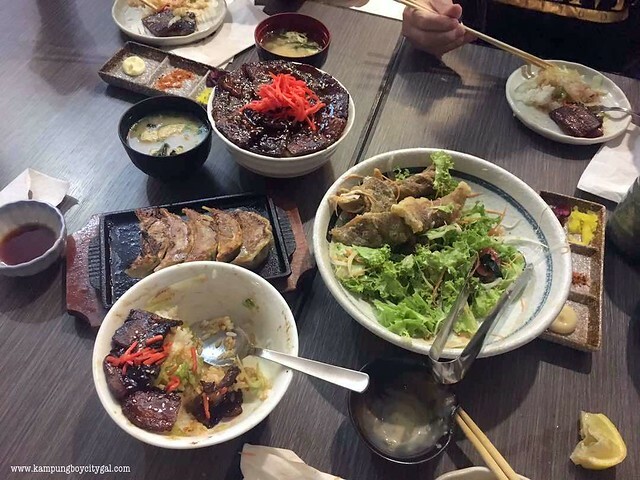 This place is also frequented and favoured by Japanese expats and their families, which can only mean that their food is really good!! 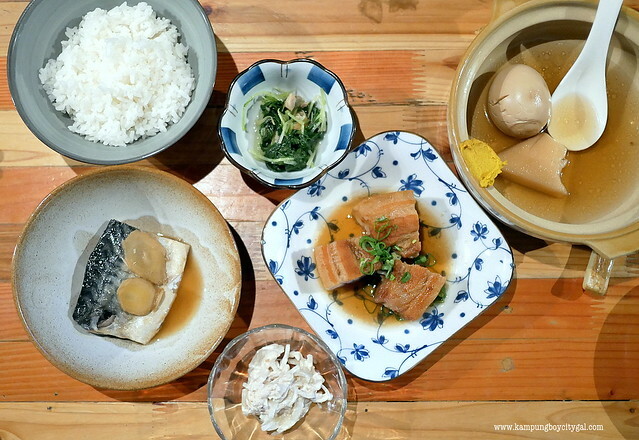 The home-style menu boasts comforting Japanese home cooked dishes such as kakuni (braised pork belly), braised/grilled fishes and oden in light dashi broth. Feel free to choose what you want in your bowl of oden – options include hard-boiled egg, daikon, konjac, fish cakes, tendon meat etc. 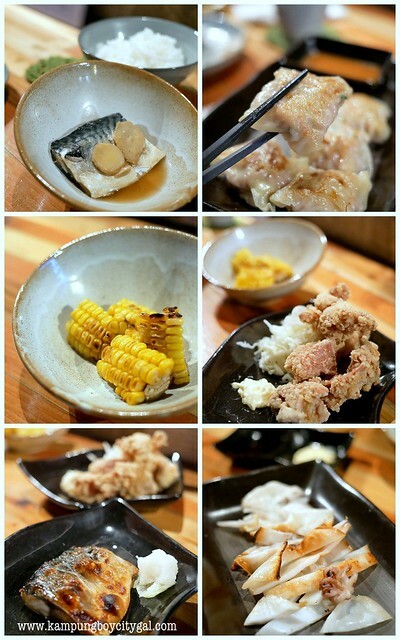 We also order some gyoza, grilled corns, chicken karaage, grilled saba and grilled squid to go with some beer. Akashiyaki, a small round dumpling from the city of Akashi in Hyōgo Prefecture is also available here. 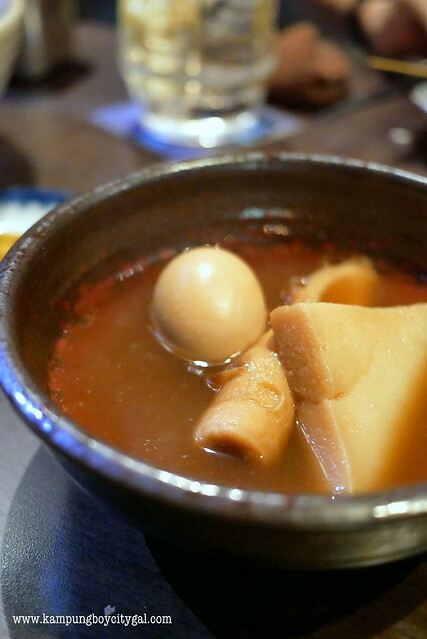 The dumpling is made of an egg-rich batter and octopus dipped into dashi (a thin fish broth) before eating. It is the fresh and honest flavours that woo us here, at Saisai. Don’t you agree that Japanese cuisine is just that – a celebration of flavours and seasonal ingredients in their purest state? 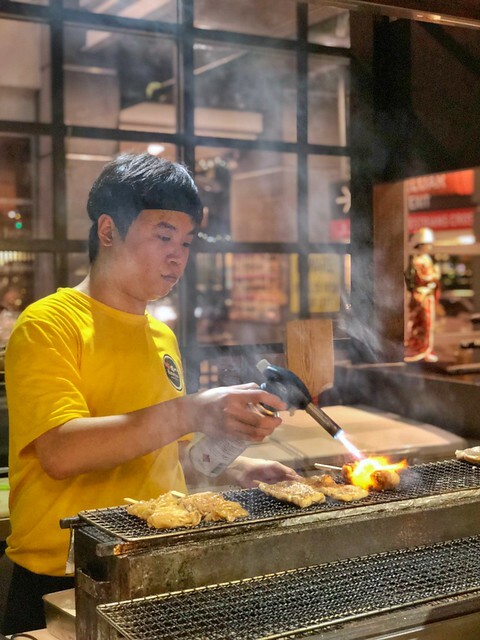 Toridoki 鶏鬨 is a Yakitori restaurant from Tokyo which has just introduced its first overseas branch at Desa Dri Hartamas few years ago. 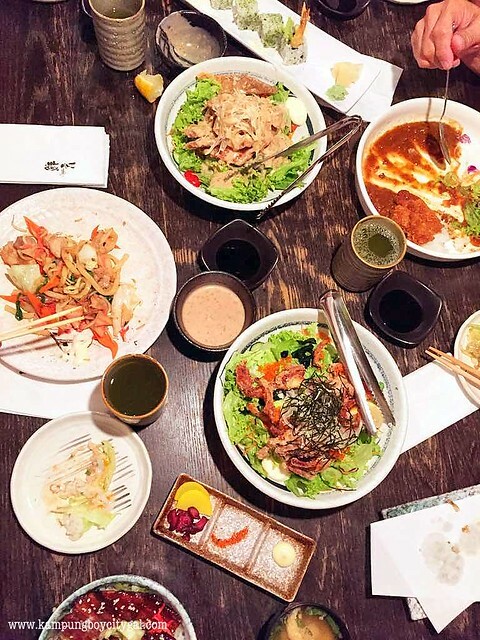 The restaurant has a comfortable atmosphere, with a retro-modern interior and several types of seating, such table seating, horigotatsu (sunken kotatsu table), and private rooms. 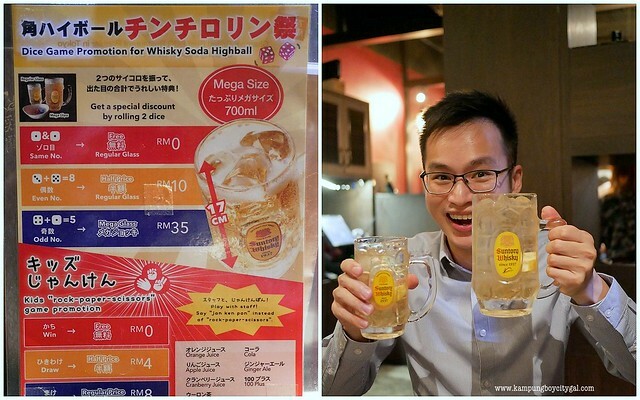 Patrons can also take part in a fun dice game for whisky soda highball. Remember to try your luck on getting a free drinks. 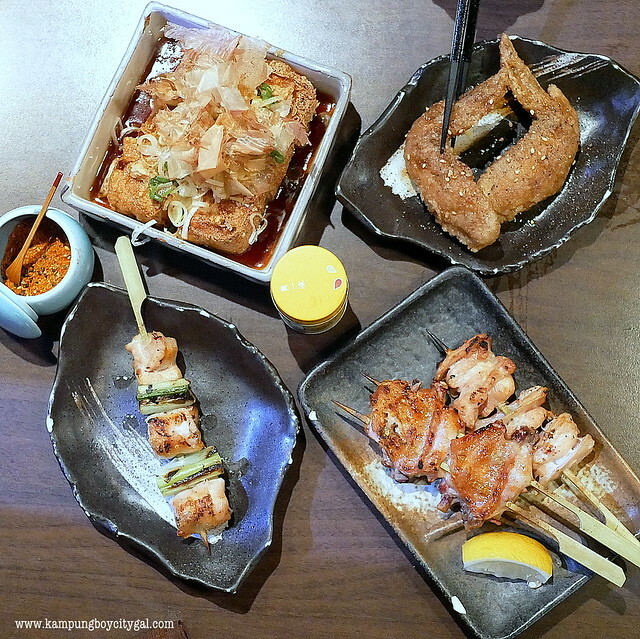 Yakitori (grilled chicken skewers, RM5 to RM10) is the main highlight here. True to the Japanese beak-to-tail philosophy, chicken hearts and chicken’s tail feature on the menu, as well as more traditional pieces.All the chicken served here were carefully selected from the best suppliers, in order to ensure the quality. Another dish that you can’t miss is the juicy and crispy Teba Age – Nagoya style fried chicken with sweet soy sauce and black pepper (RM10, 2 pieces). 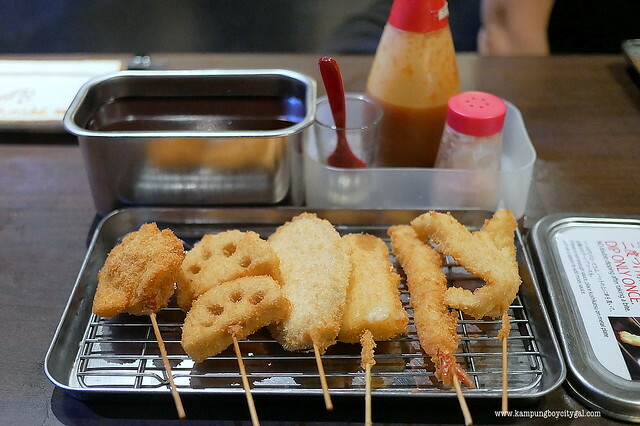 Kushikatsu (RM 5 to RM 8) is essentially deep fried food on a stick—or more specifically, battered meat and veggies. It can be found all over Japan but is most famous in the Shin-Sekai neighborhood of Osaka. Dip it with the Osaka style sauce (free) and you get the best beer snacks ever. Oden is another specialty here too. Love the thicker than usual broth and hand picked ingredients. Actually we like all the other side dishes better than the yakitori here. Nanban Tartar Sauce (RM 22) is a deep fried chicken dish coated with Japanese sweet and sour sauce, served with tartar sauce and egg yolk crumbs. The Daikon Salad (RM 20) was refreshing – thinly sliced daikon served with sour plum sauce and topped with deep fried mountain yam. The eihire (RM18) is actually charcoaled grilled fin ray that is full of umami flavours, great as beer snack! If you are a chicken skin lover, do not miss out the Torikawa Ponzu (RM 10) – boiled and shredded chicken skin with ponzu and served with leeks cooked in dashi soup. 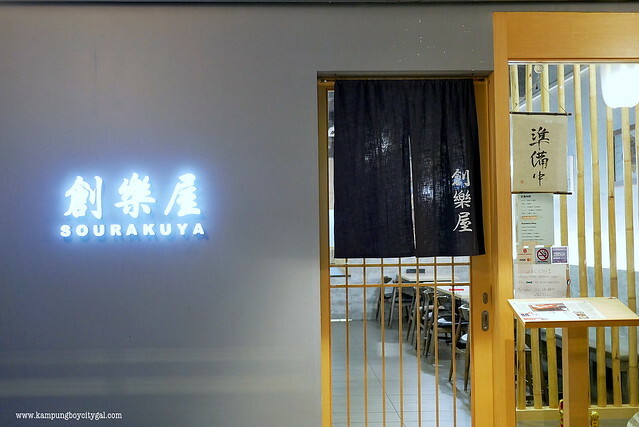 Sourakuya is another Japanese family-styled restaurant manned by a husband and wife team (Malaysian husband and Japanese wife) as well as headed by Osaka native Chef Ogawa Tetsuya. Even though it is a family-style restaurant, Sourakuyua never compromises on quality. The restaurant imports fresh seafood regularly and the food selection is quite nice. All of the dishes aren’t that expensive either. Most things on the menu are served in mid-sized portions, so they can be shared with friends or eaten alone if you’re quite hungry. My personal favorite is the tamagoyaki (RM 8). 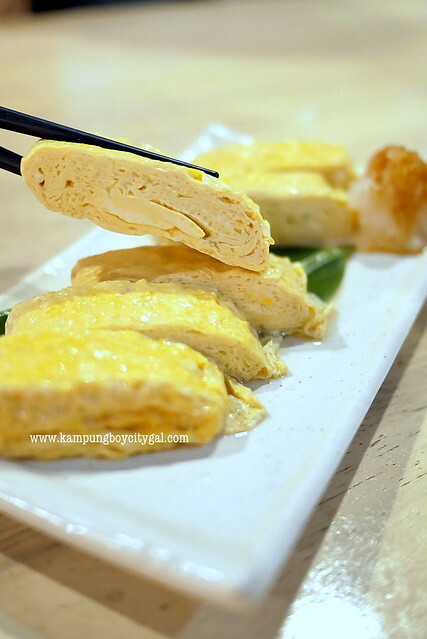 Tamagoyaki is thin layers of eggs cooked and rolled into a log using a special rectangular pan. How it’s seasoned is different by each household. Some Tamagoyaki is very sweet but I like Sourakuya’s version because it is seasoned with dashi stock and not too sweet. 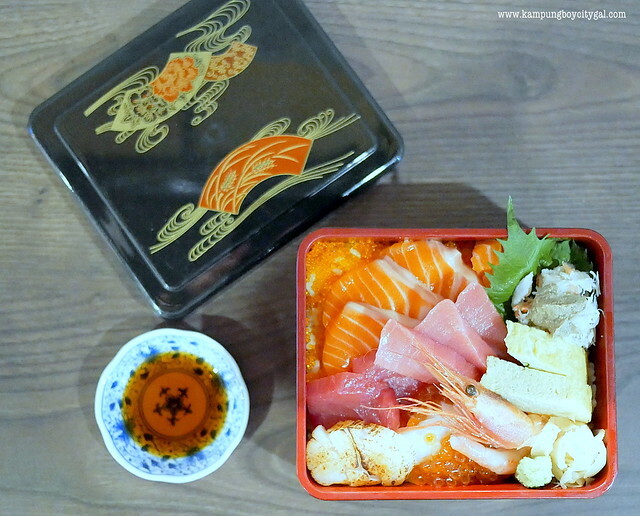 I really enjoyed having the Kaisen Don (RM 50) too. They were generous with the sashimi and it was relatively fresh for the price you’re paying. I love the aburi scallop, ikura and creamy crab roe the most. So good! 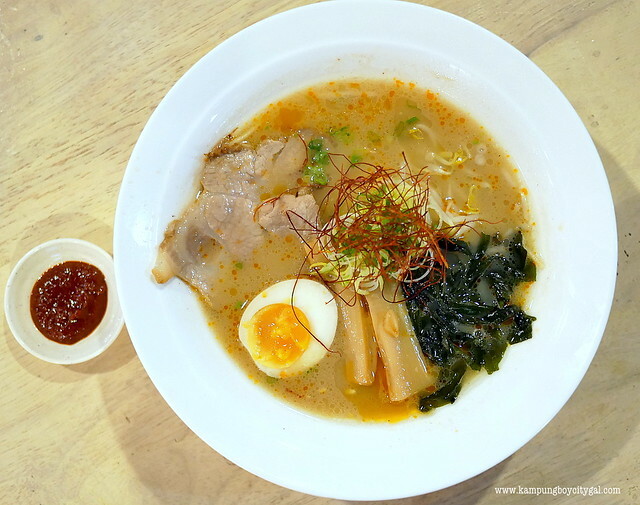 Tonkatsu Ramen (RM 22) is one of their signature dishes. 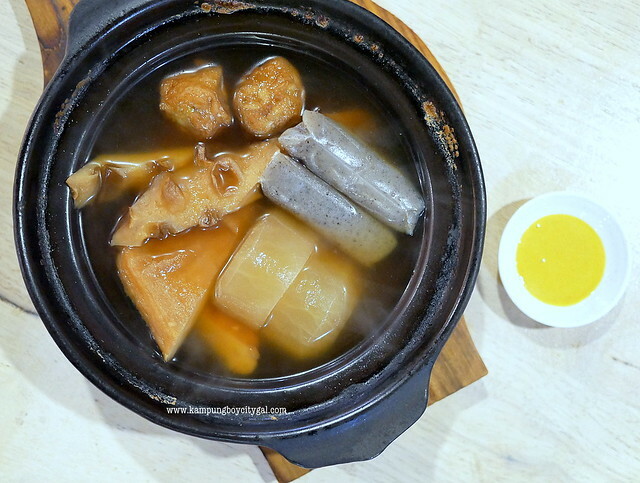 This broth is milky and unctuous, thanks to pork marrow bones and fat cooked for hours. I love the melt in the mouth pork belly and soft yolk eggs but the noodles were too soft for my liking. We couldn’t resist ordering their oden, a delightfully warming comfort food on a rainy day. Add: 17 Jalan Radin Bagus 9, Bandar Baru Sri Petaling, Kuala Lumpur. Hours: Mon, Wed-Fri: 11.30am-2.30pm, 5.30-10.30pm; Sat-Sun: 12pm-10.30pm. Closed on Tuesdays. 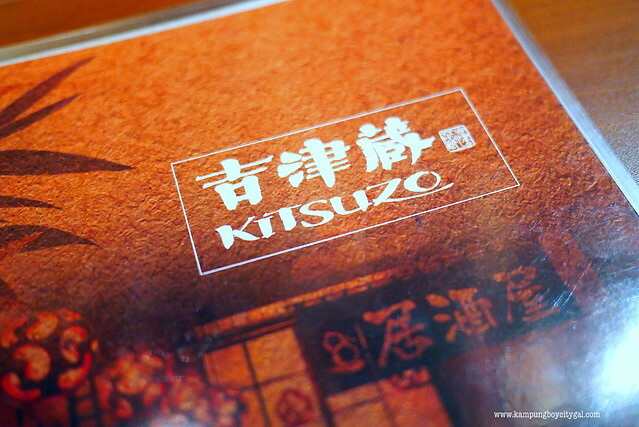 Located in Wisma Rapid at Desa Sri Hartamas, Kitsuzo Izakaya offers you an authentic and unique Japanese experience. It is a great place for a quick beer after work or you can even order ten dishes and stay all night. 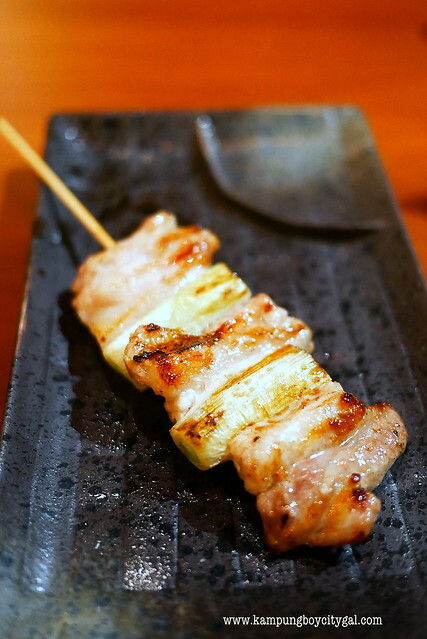 Kitasuzo serves a variety of chicken dishes, centering on yakitori (grilled chicken skewers) that are slowly grilled over charcoal. 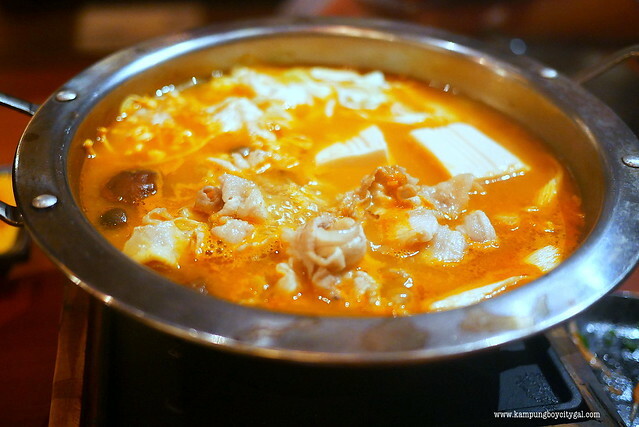 We were here on a rainy day so we ordered the something soupy – a kimchi nabe. 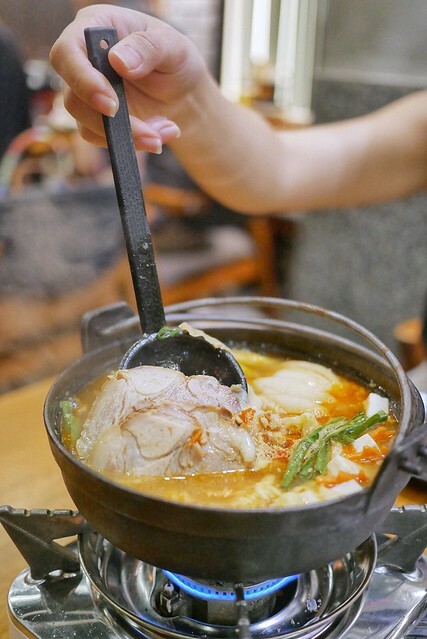 Nabe or nabemono is a hot pot dish cooked and shared at the table, and this hot pot uses kimchi for extra flavour and spiciness. The addition of pork slices and tofu makes this a wholesome meal too. 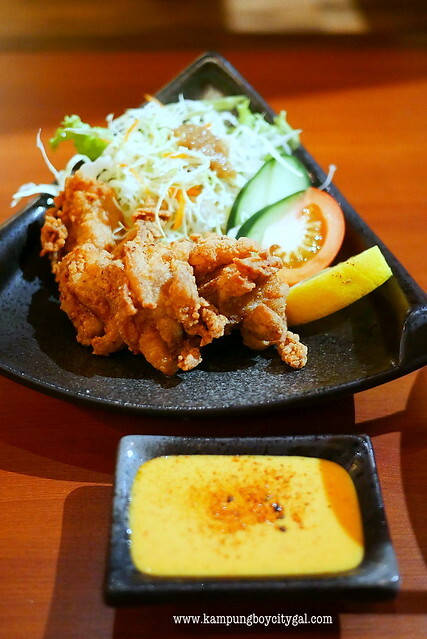 Fried to perfection with a crisp texture on the outside and super juicy and tender on the inside, the chicken karaage pairs excellently with a glass of sake or beer. 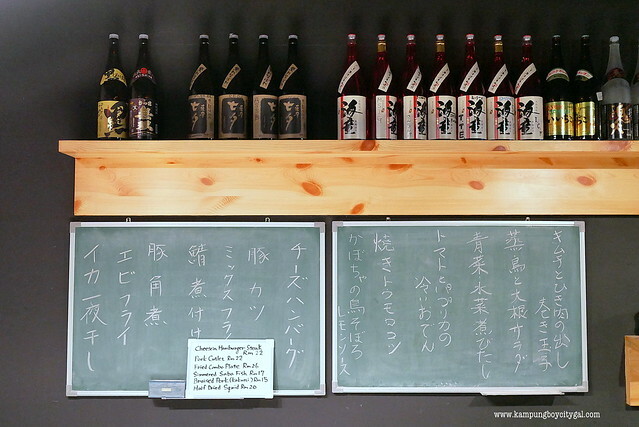 Their menu has a focus on yakitori, but they also serve some other Japanese dishes with a very good selection of Japanese sake, wines and other spirits. Add: Lot Wisma Rapid,, 30, Jalan 30/70a, Desa Sri Hartamas,, Desa Sri Hartamas, 50480 Kuala Lumpur, Wilayah Persekutuan Kuala Lumpur. Senya Izakaya is like my neighbourhood canteen; we eat there ALL the time but never bother to take any proper pictures of the food. Who takes pictures of their daily chap fan or stir fry anyway? There are a few Senya outlets in town – Intermark, Mitsui Outlet Park, Publika and Jalan P Ramlee but we frequent the one in Publika and Jalan P Ramlee the most. There’s nothing particularly sophisticated about the setting in Senya; a mixed crowd of Japanese salarymen, local office workers and couples sit either at the plain wooden tables or prop up the bar, where you can see into the tiny open kitchen, occupied almost entirely by a sizable grill. The Hokkaido Pork Don is a must order here. It claims to use a unique grill method, where the meat is cooked over a charcoal fire while it gets coated over and over again with a sweet soy sauce. Love love love the charred edges, smoky flavour, great balance of fatty vs lean meat and sweet, salty glaze. The Pork Don can be enjoyed with potato salad or tamago onsen too. 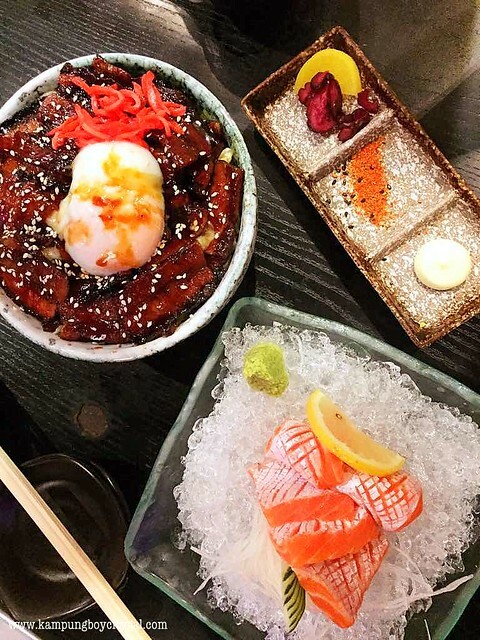 Our other favourite items are the salmon skin salad, grilled salmon cheek (shio), spicy ramen, kimchi pork and (thick cut) salmon sashimi. Hours: 12pm-2.30pm (Lunch) 5pm-10.30pm (Dinner). 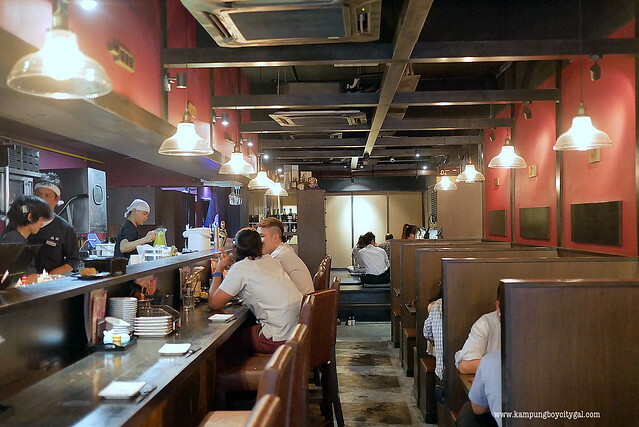 It seems like most of our favourite izakayas are located in either Mont Kiara/Publika/Desa Sri Hartamas area. 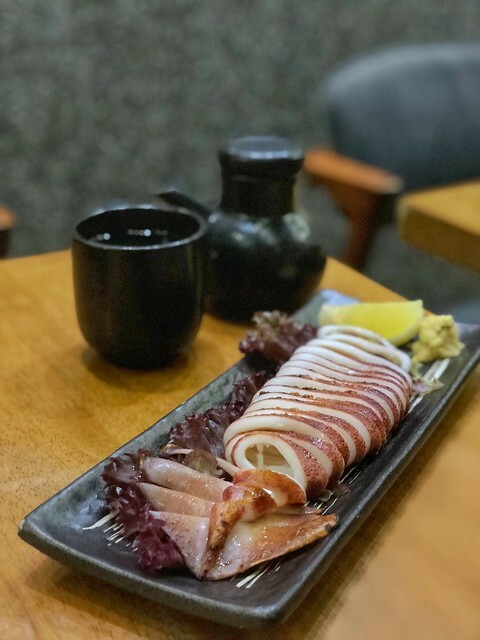 Robataya Izakaya’s menu is pretty extensive – apart from the usual yakitori, they also have yakiniku, kushikatsu, nabe hotpot, sashimi, okonomiyaki, rice bowls, ramen and more. The restaurant offers fun and relaxing dining experience. They also serve air-flown seafood and vegetables imported directly from Japan. Feel free to choose how you would like the chef to prepare your seafood in robatayaki, sashimi or tempura. 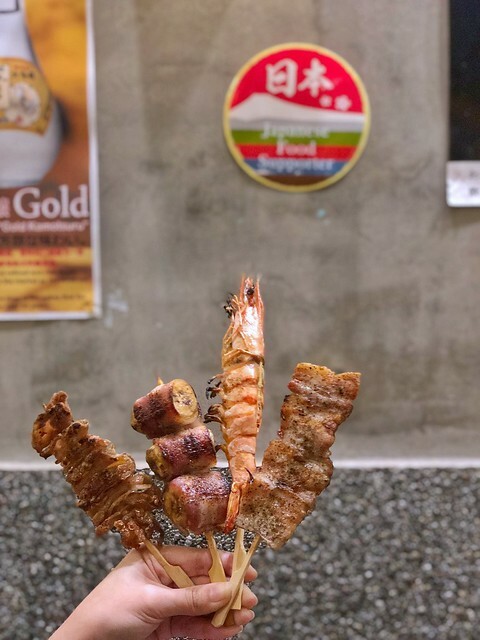 Remember to try some of their their signature skewers here – the banana bacon, chicken skin, pork belly and gyoza wing (boneless chicken wing stuffed with gyoza filling) were really good! The Grilled Ika here is really, really good! Just cooked-through, each bite of the squid had that distinct smokiness and the texture is still quite tender. Enjoy the original flavour by just adding a squeeze of lemon! The ebi mentai mayo is a must order too. Robataya uses big sized prawns so the flesh is very meaty, bouncy firm. The generous topping of mentaiko sauce was sweet, savory and definitely creamy! Actually everything that we tried is a must order here because we asked for “osusume” (recommendation) from the staffs and manager here. Hokkaido nabe pot was warm, soupy, and comforting for dinner. It was loaded with all my favourite ingredients such as chashu, cabbage, corns, minced meat, tofu and onions. 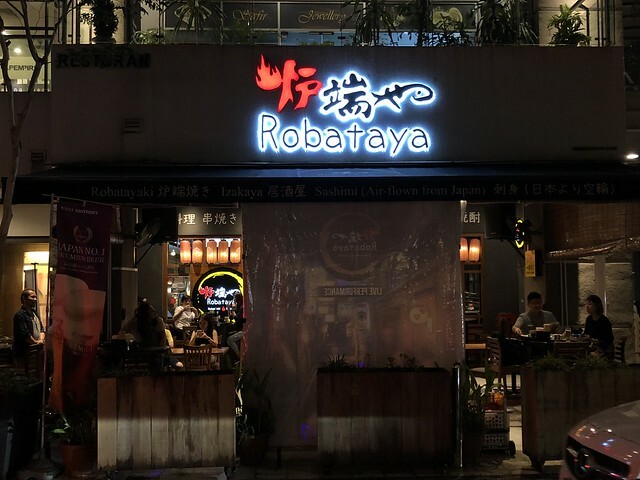 Add: Robataya Izakaya, D4-G3-09, Solaris Dutamas, No.1 Jalan Dutamas 1, 50480 Kuala Lumpur, Malaysia. Hours: Mon-Thu 11.30am – 2.30pm; 6pm – 11pm. Fri 11.30am – 2.30pm; 6pm – 11.30pm. Sat 11.30am – 11.130pm; Sun 11.30am – 11pm.